Nowadays, it seems that the Eclipse C/C++ Development Tools (CDT) is quickly becoming a de-facto standard especially for Embedded Development. As Bill Graham points out, this is mainly the result of the efforts of embedded tools vendors or RTOS vendors, who have extended the CDT for cross-development environments with remote target debugging and the like. Recently I’ve worked with Eclipse-based Nucleus EDGE from Mentor Graphics as an embedded IDE with Microtec compilers for a ColdFire target and was quite pleased with the overall development environment (comparing this to the old Nucleus EDE some years ago which was a set of macros to be imported in Microsoft Visual Studio 6, which led me to use vim and make on Cygwin as my main development tools. btw, if you are like me and vim is indispensable to you, then you can add vi functionality to Eclipse with viPlugin – this one is commercial, but there exists other plugins as well). Now, as I’ve had some time to spend on my Macbook Pro, I wanted to know what the “vanilla” Eclipse CDT from www.eclipse.org has to offer for building self-hosted C/C++ applications with standard GNU C/C++ tools (the Apple GCC 4.0 compiler in that case). 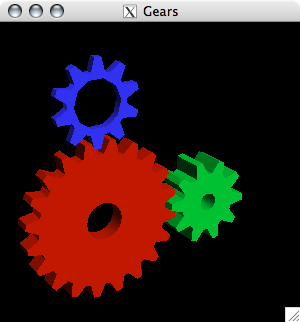 As example source code I decided to use the famous rotating 3-D gear wheels from Brian Paul that has been converted to GLUT. The source code is in the public domain and can be found here. 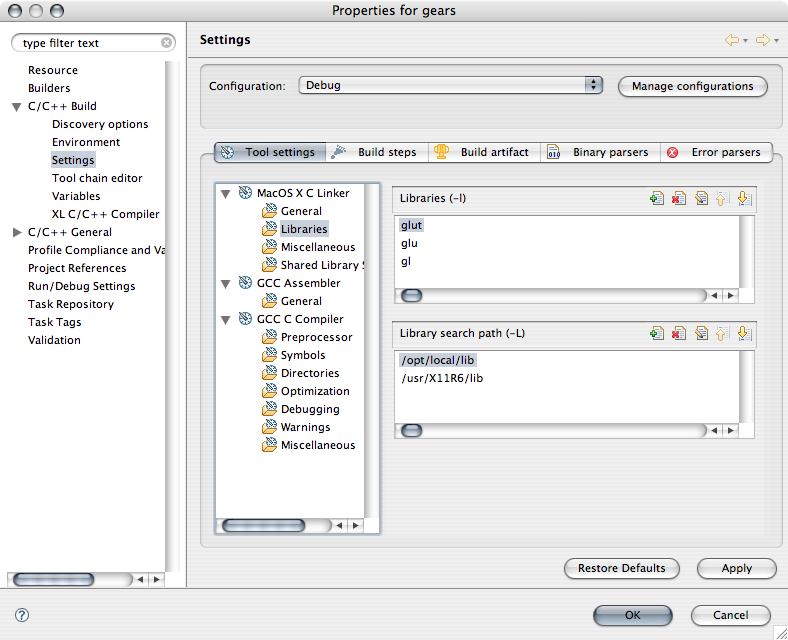 On Mac OS X the OpenGL Utility Toolkit (GLUT) can be installed with MacPorts. 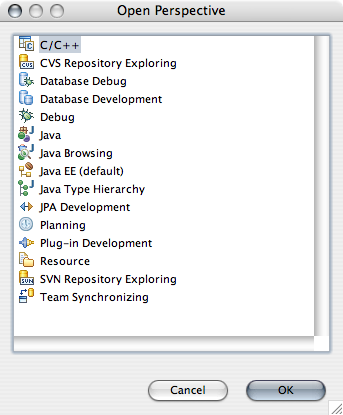 in the Eclipse update manager to download the CDT features. 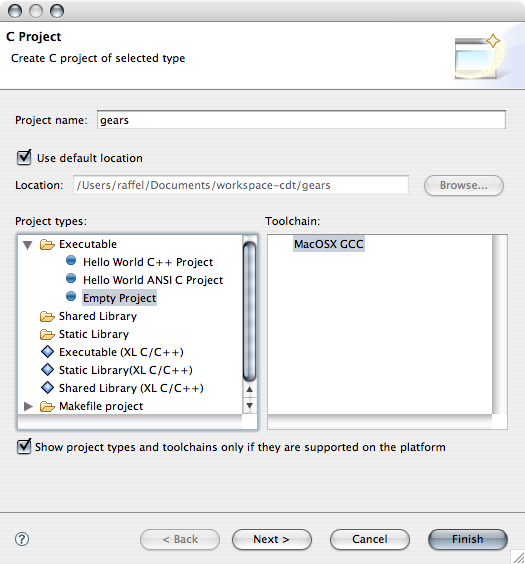 Then create an empty C project and select the Apple GCC toolchain. 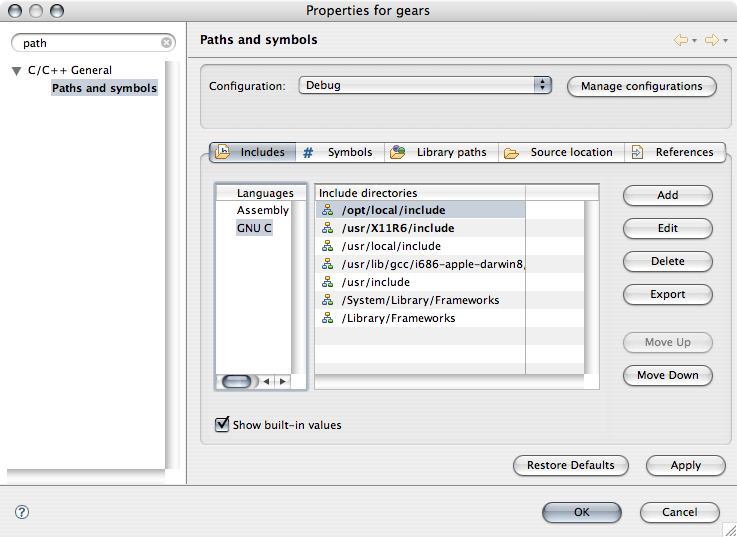 Add the include directories /opt/local/include and /usr/X11R6/include in the project properties. Now the required libraries need to be added to the linker settings. 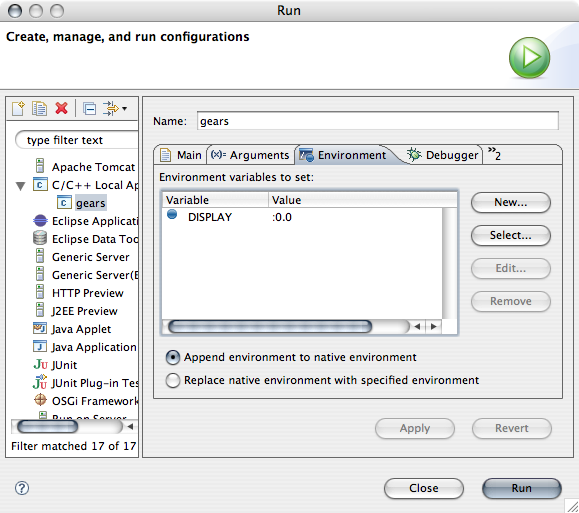 I am getting a problem with Eclipse and glut. Loved the tutorial, but it is saying “library not found for -lglut” Any ideas? Looks like GLUT no longer is available by that command on macports if anyone is still reading this article they should write “sudo port install mesa” instead glut seems to be included in that port. Well, I am running Mac OS X 10.6.3 and I was able to follow the tutorial as is. Including the “sudo port install glut” command. Nice work, thank you! I’m impressed that a computer related article is actual even after almost 4 years. Respect for the articles author. Anyone know if theres something somewhere else in the eclipse settings that is preventing it from working? I will really appreciate your input. I am using a macro, lion os, 64 bits if that adds anything. it asks me for password. what should i type in there :/ ?